It’s a new day for one of Coronado’s most historic buildings, as Hotel Marisol Coronado debuts on the site of what had been the Blue Lantern Inn built in 1927. In its heyday, the Blue Lantern was one of Coronado’s most popular inns and gathering spots. Over the years, the property at 1027 Park has had numerous owners and names. For severaal years up until 1972, it operated as the Hotel Coronado Biltmore. For the past four decades it was known as the Village Inn, until Coronado residents and business partners John Murphy and Ann Keyser purchased it last year. 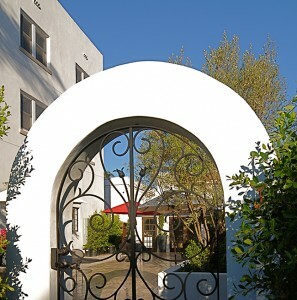 Murphy and Keyser have a solid history of real-estate investment and restoration of historic properties throughout Coronado including The Chateau (circa 1939) at 727 D Ave. and The Monterey (also on D, across from Vons). The latter project converted a 1920s-era Spanish Mediterranean-style apartment complex into a historically designated condominium project. Hotel Marisol Coronado may be Murphy and Keyser’s crowning achievement. 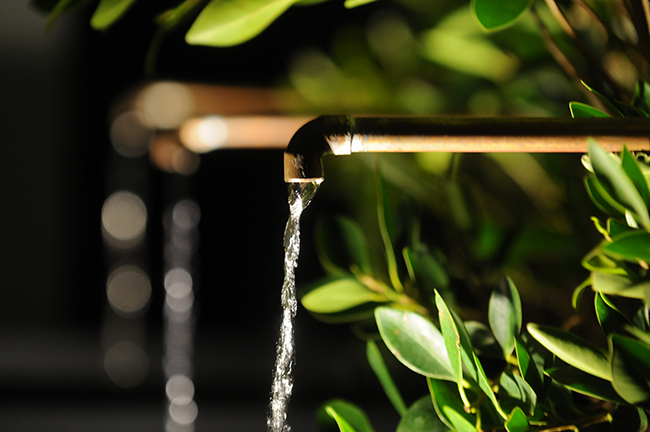 Keyser describes Hotel Marisol as a “coastal boutique hotel” and, as with most successful renovations, the delight is in the details. 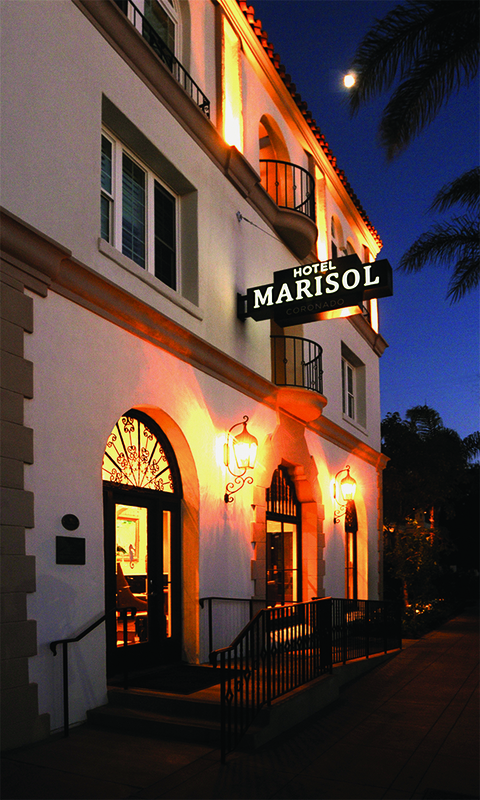 Keyser chose the name Hotel Marisol Coronado to honor the building’s Spanish Eclectic style as well as its close proximity to the beach. Shortly after the purchase went through last year, Keyser shared her vision of the property with Coronado’s Historic Resource Commission and obtained a historic designation. Restoration work began in earnest last January. 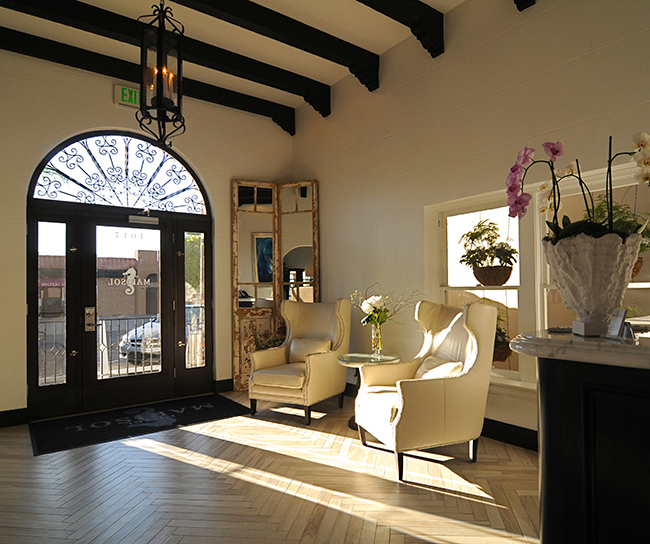 Keyser had the stucco sandblasted off and returned the building to its original façade coloring of a cream with taupe accents. Two large wooden windows were replicated to the period and new wrought-iron finishes and period lighting fixtures were installed. A new ADA handicapped-accessible ramp at the building’s entrance was also embellished with wrought-iron railings. While the footprint of the six rooms each on the second and third floors was largely unchanged, all spaces were renovated from floor to ceiling. 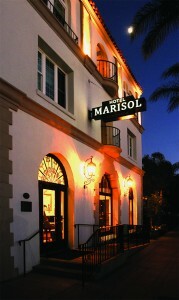 Hotel Marisol Coronado now features 15 rooms including four suites with king beds and sofa beds. All have private baths with double-sized showers; suites also feature deep soaking tubs. Keyser’s design background provided an intuitive knowledge of when to reflect history and when to introduce contemporary style. Bowing to the historical period, showers feature subway tile backsplashes, and floors are tiled with period black-and-white hexagons. Keyser has provided luxurious Italian frette cotton bedding and sleek custom-made furnishings. Top-flight technology includes complimentary Wi-Fi throughout the hotel with all rooms equipped with high-definition flat-screen televisions, iPod docks, refrigerators, in-room safes, Keurig coffee brewers, air conditioners and ceiling fans. The first floor has gone from dark and dreary to open and elegant. The old space was chopped up and much of it had been cordoned off for a manager’s quarters. A side room, without a seeming purpose, had been mostly unused, and furnishings had seen better days. Now the space is brightened with a light palette and paintings of the sea (by Keyser’s sister, artist Susan Phillips). Three guest rooms have been added, including a king-bed handicapped-accessible unit. The former side room is now the living room, outfitted with smart contemporary seating and, each morning, the site of a wide assortment of breakfast pastries, fruit, juices and coffee. Keyser recruited Sue Gillingham as managing director of Hotel Marisol. Gillingham is best known and respected in Coronado for overseeing the opening and formative years of Coronado’s 1906 Lodge. The hotel provides free beach chairs and towels for guests. Gillingham noted that while the hotel does not have onsite parking, it offers free loaner bikes and optional limousine services for airport transfers. Fall prices range from $239 for a queen room ($199 mid-week) to $299 for a king suite. More information is available at marisolcoronado.com or (619) 365-4677.